To hell with happiness. More important was excitement and power and the hot stir of lust. Those made you forget. Dorothy Hughes’ bewitching and disturbing novel In a Lonely Place has been re-issued by New York Review of Books. It very much recalls some of Jim Thompson’s darkest works, though she’s arguably an even better writer than he was. Hughes’ stylish evocation of a psychopathic psychology is like one of those sweetened Russian cocktails that tastes wonderful going down even though you know it’s burning out your insides and will leave you full of the blackest regret in the morning. I can’t recommend the book strongly enough, though not for the faint-hearted. Once you have read it, consider watching the unforgettable film adaptation, which I recommended some years ago and re-up below. 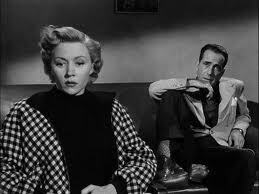 Amazingly, there are people who consider themselves Humphrey Bogart fans who have never seen the brooding, powerful 1950 film In a Lonely Place. In one of his greatest roles, Bogart plays bitter, hard-drinking Hollywood screenwriter Dixon Steele, whose best days seem to be behind him. After being tasked with adapting a dreadful novel for the silver screen, he asks a ditzy hat check girl who loves the book to come to his apartment and tell him the plot. The next morning, the police inform Dix that the girl has been murdered and dumped by the side of the road. As the audience, we do not know what really happened. Steele is initially alibied by sultry neighbor Laurel Gray (Gloria Grahame, all eyebrows, curves and nimbly masked emotional turmoil), who promptly yields to his romantic advances. They fall in love and Dix is able to regain his gifts as a writer. But as Laurel sees Dix continue to be volatile and aggressive, she begins to wonder, Suspicion-style, whether Dix is a murderer after all. This movie is cynical about fame, Hollywood, and human relationships, but tantalizes us with the possibility that new love can redeem it all. The suspense emerges less from the murder mystery than from the warring internal emotions of the characters. Director Nicholas Ray knew life’s dark places and how to get actors to go there. His marriage to the volatile Grahame ended in the most sordid way imaginable while they were making this movie, and the anguish and anger on the set comes out in the electric performances of the cast. The film is also remarkable for its opening five minutes, which are a clinic in how a great director and actor can establish a character with ruthless economy (incidentally, the bar in the opening scene was modeled after Romanoff’s, Bogart’s favorite drinking hole). There are countless movies told from the man’s point of view in which a beautiful, younger woman falls in love with the protagonist (indeed, Bogart himself made a number of such films). The women in those movies are flat characters and we aren’t told why they go for the hero. He wants her, the story needs them to fall in love, so they do. What is truly remarkable about this movie’s structure is that it follows this formula about half-way through and then flips the perspective to the woman’s point of view. As the film progresses, Dixon Steele becomes flatter and Laurel Gray becomes more developed. Through Grahame’s strong performance, we see Laurel’s doubts and fears about Dix, and how they compete with her love of him and her desire to save him from himself. If you follow this part of the film out emotionally, its ending, which I will not spoil, is less sad underneath than on the surface. This bi-fold structure to the storytelling is truly creative work by Ray, and it’s no wonder people like Martin Scorcese admire him so much as an cinematic innovator. Burnett Guffey contributes some riveting camera work, adroitly using lighting and pull out and point of view shots that maximize the impact of the acting. Character actor Art Smith is an appealing foil to Dix as his long-suffering agent and friend (a role not unlike his part opposite a tough-as-nails Robert Montgomery in another terrific film also based on a Dorothy Hughes novel, Ride the Pink Horse). The film has also inspired some wonderful spin-off products over the years, including a moody song by The Smithereens and Suzanne Vega and a short film by L.A. Confidential Director Curtis Hanson revisiting the making of this classic movie. My wife and I saw this years ago, probably back in the early '90s. Her comment was that the movie had a happy ending – she left him. I saw the movie last year….Bogart is really good…I'll have to read the book since I'm a huge fan of Jim Thompson. Your sordid comment was puzzling….it must be really bad because there have been some pretty awful endings to Hollywood marriages….so looking it up….wow…that was indeed sordid…and she did Oklahoma! after that….and then her life takes another weird turn after that movie. Previous Previous post: At What Point Mercy?